The perfect staging in a spirited ambience insures that your special ball will be an unforgettable experience for your guests. Your guests will sense that this traditionally planned, tasteful ball-opening, is the successful up-beat to a heady night at a ball. At the beginning of the opening, you will experience the impressive procession of the dance couples, the men in black tails, the women in festive white ball gowns. In the presence of our dancing master, our attractive dance pairs offer you an opening which is both original in its staging and varied in its choreography. And while you're at it, let a vivacious polka or a lilting waltz put you in the mood to dance, and take pleasure in the contredanses which will be performed especially for you and your guests. As the crowning glory of the opening, either you as presenter, or our dancing master, will invite the ball guests to dance with the classic words "Alles Walzer"- the traditional signal: "let the waltz begin". We will gladly accommodate your personal wishes as regards special programming and/or the number of dancing couples in the opening committee. Would you also like to invite your guests to participate in the beloved midnight-quadrille? In that case, our dancing master will invite your guests onto the dance floor shortly before midnight. 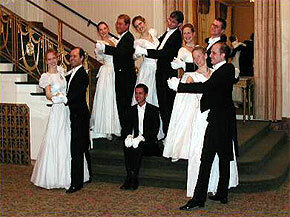 Subsequently, he will moderate and direct in a very amusing manner, either in German or in English, the six dances of the "Fledermaus-Quadrille" by Johann Strauss, jr., thus allowing your guests to take the center stage - a particular ball speciality from Vienna and great fun for the members of the audience who dance along. This evening allows a night at a ball that they always dreamed of become a reality for your guests. Of course, both the opening committee as well as the dancing master may also be booked individually. We will gladly offer you an ensemble from our varied selection for the musical accompaniment to our opening committee. In order that you can make your own personal decision, we invite you to click on Ball/Viennese Dance Music.